Push off from the shore. Night time finds me on a chair noting a stillness in the air. Sketching from some great photographs. Owl pencil studies. Recent travels have filled my head with images, words, and birds. I think I’m having a hard time finding my footing but once I do I’m confident I’ll come out with something new. Trying to find that point to launch the boat from without getting my feet wet. If I don’t come up with it in the next few days, I’ll just hang the shoes out to dry in the sun. I’ve been sitting on this one for a few months. I made it as a gift to my two wonderful friends who were recently married. I had been wanting to make a landscape on plywood for some time. My friends home state was a great inspiration. Modeled after the Flatirons near Boulder, CO. and a bit of the Red rocks. Running through pages in my notebook, and in the back of my head. Leads me to one thought. A thank you to those who picked me up when I fell, and to those that fell with me when we climbed too high. And a thank you to everybody who has stopped by here and read my nonsense. One of my favorite names for a bird. On a sign in Colorado. I put down my cup of coffee. I was frustrated. I don’t even drink coffee. I suppose though except for that particular day. I like the smell but care not for its taste. A touch too acrid. It was our conversation rather than the beverage that lead to my displeased state of mind. Coffee wouldn’t make me frustrated like that, shaky probably, but not frustrated. We finished our passing back and forth of sentences, and I turned to the door. A series of revelations poured over me like a rain of nails and glass. That she had never read a single poem I wrote, never heard a single note or verse of any song I loved. She hadn’t looked into any drawing I had rendered. She hadn’t listened to anything I had said about who I am and what I mean. It can be painful to learn the assumptions others have made of you. That’s a realization that’s a lot more frustrating than any cup of anything. Save for a cup of angry fire ants, though that too would be more physical pain than frustration. Well I didn’t drink any more coffee, instead I listened to 100 verses of ragtime, and conjured up every imaginable bird under the sky. Because, all joking aside, I don’t drink coffee, I draw birds. Finding ghost birds in the grain, while walking home in the rain. And an ending hand written by Hemingway. 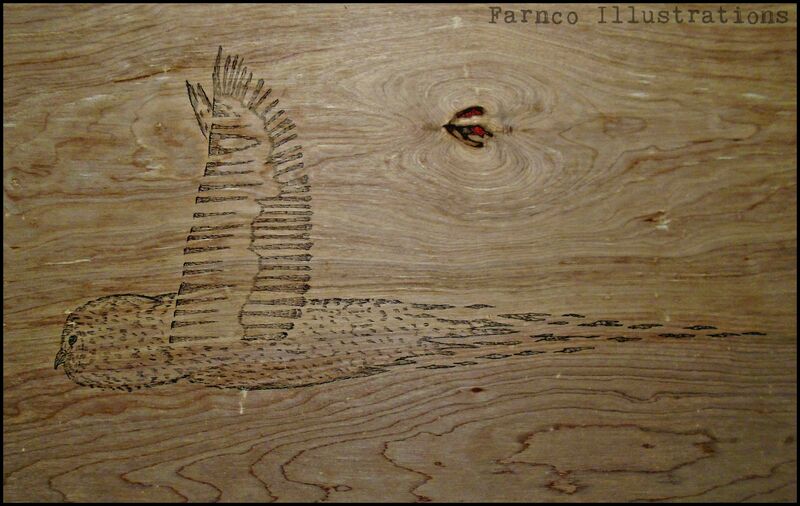 I had originally planned on using this piece of wood for a hawk drawing. After several sketches none of which proved up, I cleaned the surface and started anew. The Warbler shape is always a good go-to. I used a similar approach as the recent large hawks in flight. Leaving openings to let the wood do some of the talking. A shot from the field today. Various trails and fire roads brought me to my favorite stretch of tracks in California. While I didn’t spot too much of note, the sky was clear and the day was a fine one. Back in the lab tonight brought an interesting take on a flying owl. A poem and a pencil drawing. That was the summer our kite strings tanged up together. The one that dragged me through the years and one hundred thistle patches to right here standing on your front porch. No flowers in hand, just some dried Bull thistle stalk. Standing before you, I can hear the years start to talk. truth being I can see without you clear as day. Nothing echoes for tomorrows sake, no words from either of us. My mind races towards the first fire escape, looking for a way through the red tape. I’d rather be anywhere else, maybe in Chicago waiting for a bus, or East St. Louis waiting for a train. but for this everlasting second staring into her eyes brings an unnerving sort of pain. I could be in South Dakota, drinking a can of orange soda. Or maybe a Laundromat in California, counting change, hoping my thoughts could re-arrange. I look to my feet to curse whichever shoe, for bringing me here to stand before you. My goodness though, the visions of our shared past. An idea I knew could never last. once pausing to wipe the sweat from my brow. And all the while under the eaves of your front porch. Where we stood in this unending brief passage of our time together apart.